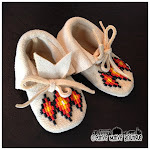 A few months ago I finished these fully beaded moccasins for my 1 year old son. 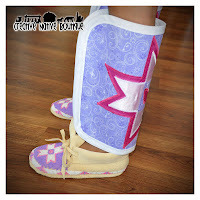 They are a Shoshone Design. I made them to match his Grass Outfit from a previous post. These are a size 3.
and these ones are about the size of a 1/2 dollar...They are backed with leather and have a beaded border. I've always been interested in Museum-quality reproductions of old Indian beadwork. Here are a couple of my "renditions" of Old beadwork. I used some "old" beads in colors that are hard to find to make them look a little more authentic. This beadwork is a Sioux style...The pouch above was made out of commercial tanned hide; and the one below with more traditional Brain-tanned deer hide.